Medium: original lithograph. Published in 1964 by Eberhard Kornfeld for 1 Cent Life, from the unsigned edition of 2000. Sheet size 16 x 22 3/4 inches (408 x 580mm). There is poetry text (composed by Walasse Ting) beneath the image and on verso, as issued. Not signed. Note: this lithograph was printed on two separate sheets which join together. Medium: original lithograph. Published in 1964 by Eberhard Kornfeld for 1 Cent Life, from the unsigned edition of 2000. Sheet size: 16 1/4 x 22 3/4 inches; image size 16 1/4 x 18 inches; with center fold and poetry text (composed by Walasse Ting) to the right of the lithograph and on verso, as issued. Not signed. 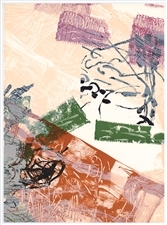 This original Riopelle lithograph is from the famous "1 Cent Life" book/portfolio, published in 1964 by E. W. Kornfeld, in a limited edition of 2000. The lithography was executed by Maurice Beaudet, of Paris. 1 Cent Life was a monumental undertaking-- a revolutionary Pop Art and poetry project organized by Walasse Ting and Sam Francis. Among the artists who contributed original prints to this project were Andy Warhol, Robert Indiana, Roy Lichtenstein, Pierre Alechinsky, Asger Jorn, Mel Ramos, Jim Dine, Tom Wesselmann, Robert Rauschenberg, Claes Oldenburg, Karel Appel, Antonio Saura, James Rosenquist, Alan Davie, Sam Francis, and Walasse Ting. Medium: original lithograph. Executed for Derriere le Miroir (no. 185) in 1970, and published in Paris by Maeght. Sheet size: 15 x 33 inches; this large lithograph was issued as a folded sheet with two folds. Unlike most prints published by Derriere le Miroir, there is no text printed on the back of this piece. Not signed. Medium: original lithograph. Executed for the lithograph-poem "Arctique" which was published in Paris by Maeght for the art revue Derriere le Miroir in 1974. The sheet size is 15 x 33 inches (375 x 835 mm). 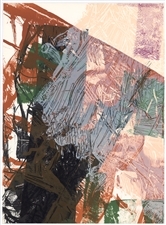 This lithograph was issued with two center folds and there are other Riopelle lithographs printed on the back. Not signed. Medium: original lithograph. Executed for the lithograph-poem "Arctique" which was published in Paris by Maeght for the art revue Derriere le Miroir in 1974. The sheet size is 15 x 22 inches (375 x 555 mm). This lithograph was issued with a center fold and there are other Riopelle lithographs printed on the back. Not signed. Medium: original lithograph. Executed for Derriere le Miroir (No. 160) in 1966, and published in Paris by Maeght. Sheet size: 14 3/4 x 10 3/4 inches (375 x 270 mm). There is text on verso, as issued. Not signed. Medium: original lithograph. Executed for Derriere le Miroir (No. 160) in 1966, and published in Paris by Maeght. Sheet size: 14 1/2 x 10 3/4 inches (370 x 270mm); with text on verso, as issued. Not signed. Condition: some soiling in the margin on the right.